Disclaimer: the title says "competitive" but it really means "as competitive as I think I can make it" which may not actually be competitive anymore. Tau are rapidly falling behind as assaults and 99% damage reduction becomes easier and easier to pull off. I waffled between bringing a Retaliation Cadre or the Stormsurge with attending marker support. I eventually decided that I really needed something with D strength in the list and went with the Stormsurge. 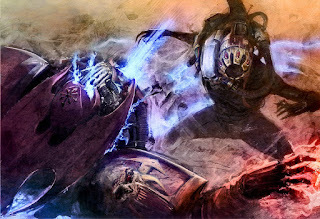 The Stormsurge is the core of the army. It acts as fire-magnet, bait, and is my ace when facing enemy Lords of War. Naturally, bringing the Stormsurge required more markerlight support than I was used to, so I had to cobble together some Tetras to give myself extra markerlights. To support the Stormsurge I needed something relatively independent, tough, but potent. I chose the Riptide Wing because I had the Riptides for it and I didnt' have enough Ghostkeels to properly run an Optimized Stealth Cadre. 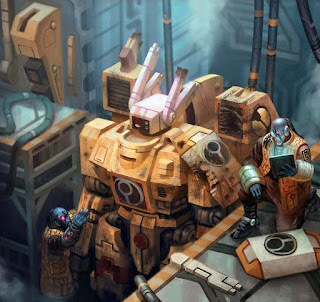 That works fine since the OSC special rule got nerfed a little bit in the latest Imperial Knight FAQ. I figure that as long as I'm going alpha-strike with the Stormsurge, I might as well bring the alpha-strike formation. The Culexus Assassin was a tough call for me, but I decided that I really, Really needed him. Psychic shenanigans are out of control, even before the new Angels of Death supplement dropped (which we are allowing in our tournament, btw). The Talisman and the Culexus are my only defense against this and my only hope of stripping away buffs from enemy deathstars. To fill out the rest of the list, I could either spam crisis suits or take the minimum requirement and add something else. The Y'vahra has always served me well and really throw my opponents, so I squeezed him in. Bonus is that the new FAQ made his flamer even better! The list is pretty straightforward. If an alpha-strike is possible, that is what I will do. My Y'vahra is going to be my secret weapon. While my opponents obsess over the Riptide Wing and Stormsurge my Y'vahra can blindside them and kill some key units. The Tetras, as well, serve as a fast moving unit that can get places you weren't expecting. Coupled with the Heatwave monats, these units can cause a lot of disruption in the enemy deployment zone. I think that in some of my games the use of the Culexus will be pivotal. If I am up against a Deathstar that uses psychic buffs I will likely need to keep him protected with my big battlesuits. I will be posting a short summary of the tournament very soon. Edit: Tournament went well. Check out my summaries of each round below. Round 1 go HERE. Short of it is that I won the game narrowly. Round 2 go HERE. Short of it is that I won by a wide margin. I swept the tourney, but it was a fairly small tourney, missing some of our better players too. This looks to be a highly competitive set-up! Unless this is a multi-day Major event, where you will be up against high caliber opponents that play much more frequently in competition, you should have a good shot at the final tables. I always agree with the decision to include a Y'vahra, they are a brutal wildcard. I will be interested to hear not only how you did, but what you would tweak in hindsight. Best of luck! Keep in mind, if you're using the draft faq as law you are limited to one relic per model now. Tau specifically allow "items" from their special list so they can take multi, plus they are never referred to as "relics" or "artefacts" like every other codex in the game. They are "signature systems"